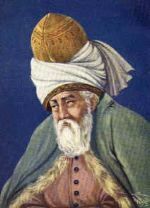 Yesterday, December 17th, was the 740th anniversary Rumi's "Wedding Day," that is, of his death. Mevlana Jalaluddin Rumi is a titanic, open-hearted figure in the world, and his influence throughout the world and down through the centuries is immense. The continuing ripple effects of his poetry and his spirit have much more impact on most lives today than mere conquerors. That's the sort of hero the world really needs. Dreams and waking up... The metaphor of being spiritually "awake" is used a lot but not always with deep reflection. It's an easy concept to grasp, though it's not taken very seriously most of the time because, of course, the person thinking about the idea of waking up is already awake in the most literal sense, right? The surprising answer is, Not really. Become profoundly dedicated to your own process of awakening, find your moment, seize it, or, rather, yield into it... and see what you think then. The experience of sudden opening reported by most mystics is startlingly one of actually waking up. It's as if you've been drifting through life in a dream state and just not known it. Nothing around you has changed, but you finally, truly see things as they are. The dream-like barrier of mental filters and projections that has stifled your perception for so long falls away like a heavy blanket. You blink, look around yourself, and are surprised to realize you've been in a sort of half-seeing trance all your life... and now you are awake. Perhaps just as surprising -- and much more confusing to the intellect -- is the simultaneous recognition that while you were in that dream state, there was still some part of your awareness that was always fully awake, quietly, patiently watching in the background. It's just that now that inner wakefulness has come to the forefront. ...A reminder to us that we don't really need to "wake up;" instead, we just need to get out of the way of that part of ourselves that is already awake. To me this suggests that each experience, each "dream," each person's life is part of a grand migration of the human spirit, a journey of deepening remembrance and renewal.